Sean Rafferty presents performances by some of the world's finest musicians. Live music from the Skampa Quartet and pianist Huw Warren. 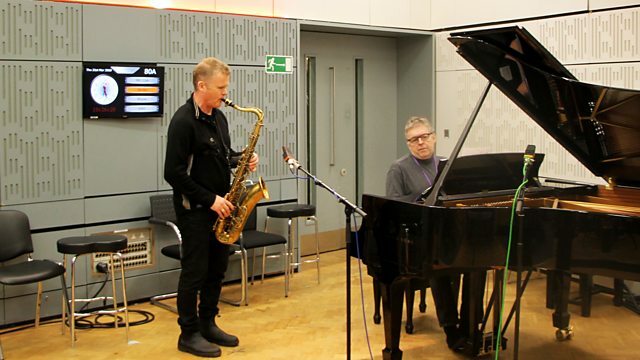 Pianist Huw Warren and saxophonist Iain Ballamy perform live for us ahead of the Bristol International Blues & Jazz Festival. The Skampa Quartet also join us for a live performance ahead of their concert at Wigmore Hall on the 22nd March; and Sean meets conductor Bernard Haitink as the LSO celebrates his 90th birthday and a career spanning over six decades. Beethoven: 6 Bagatelles & Piano Sonatas Nos. 31 & 32. Ensemble: Cupertinos. Director: Luís Toscano. Performer: Mischa Maisky. Orchestra: Orpheus Chamber Orchestra. Conductor: Trevor Pinnock. Orchestra: The English Concert. Conductor: Asher Fisch. Singer: Greer Grimsley. Orchestra: Seattle Symphony. Performer: Huw Warren. Performer: Iain Ballamy.